How fast can you port? The ever-present USB port has been given a speed bump by the USB 3.0 Promoter Group to a fast 10Mbps. The new completed specifications, which was published online on July 31, push out twice as much as USB 3.0, which has speeds of 5Gbps. USB 3.1 will be backwards compatible with its predecessors, though of course only USB 3.1 devices will be able to take advantage of the speedier specs. "In this multi-device world, the USB 3.1 updates will enable end-users to move content across devices quickly, conveniently and without worrying about compatibility," said Emile Ianni, AMD's Corporate Vice President of Platform Solutions Engineering, said in a group media release. But what about Intel's Thunderbolt? Intel earlier this year announced that the latest version of Thunderbolt will be able to transfer data at speeds of 20Gbps, twice the speed of USB 3.1. Intel introduced Thunderbolt as a competitor to the USB in 2011, which was then predominately taken up by Apple, however the company still remains a supporter of USB technology. 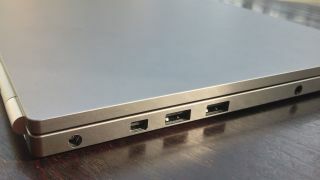 "The industry has affirmed the strong demand for higher through-put for user-connected peripherals and docks by coming together to produce a quality SuperSpeed USB 10 Gbps specification," said Alex Peleg, Vice President of Intel Architecture Group. "Intel is fully committed to deliver on this request."